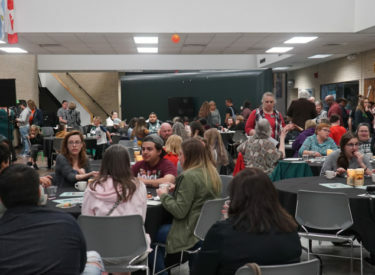 Local writers and an award-winning poet drew a crowd of about 100 to the 10th annual Poetry Coffeehouse event at Seward County Community College April 12. Winners in three categories received a warm reception as they read their work and collected prizes ranging from scholarship awards to signed copies of award-winning poet Rebecca Aronson’s newest collection of work. Aronson, who judged the contests for ages high school junior and older, read several selections from her work, chatted with local writers, and signed copies of her collection. Poet Rebecca Aronson signs copies of her most recent collection. Aronson is the author of Ghost Child of the Atalanta Bloom, winner of the 2016 Orison Books poetry prize and finalist for the 2017 Arizona/New Mexico book awards, and Creature, Creature, winner of the Main-Traveled Roads Poetry Prize (2007). She is co-founder and co-host of Bad Mouth, a series of words and music in Albuquerque, where she also teaches writing. Although a few of the 10 award-winners were unable to attend, several local writers read their work. Open category winner Jose Rodriguez performed his poem “Packing Plant,” which documented a summer job in the local industry. Fellow open category winners Karen Wilson and Lois Magner also performed poetry connected to real-life experiences. In the young poets category, students from grades six to 10 covered topics from first love to death, with humorous stops along the way. Scholarship category winners, high school juniors and seniors, showed up with instructors, friends, and intense presentations. “I was so focused on making sure my students brought copies of their poems, I forgot to print out my own,” said LHS English instructor Josh Paulus, who brought home an honorable mention award in the open category for a poem about writer’s block. Satanta English instructor Ryan Burrows cheered on his winners in both the scholarship and young poets categories. Students work together to write a poem on the spot. Guests at the event snacked on fancy hors d’oeuvres, coffee, cocoa, and lemonade through the evening. SCCC students Alize Garcia, Biviana Rodriguez, and Obadiah Barnett provided live music. Poetry “photo booth” displays provided an opportunity for guests to create their own magnetic poetry compositions. A display also highlighted a joint project between SCCC student photographers and creative writers, who collaborated to write poems about photographs, and take photographs inspired by poems. An unexpected highlight of the evening was a gift of a dozen yellow roses for SCCC English instructor Janice Northerns, who helped found the popular event. Northerns will retire at the end of this academic year. Vice President of Academic Affairs, Dr. Todd Carter, thanked Northerns for her dedication to poetry and student writing. Revenge poems have a hallowed history, and this one, which is also a free-form sonnet, is tight, and threatening, and powerful. But it’s also fun. Jodi nailed it. We were drawn to SaKya’s poem, not for what it says, but for what it doesn’t say. She deftly uses the tools of poetry to convey what’s on her mind and in her heart without saying it outright but says it very well. Aside from the personal feelings that are obvious here, this poem’s strength is its extended metaphor. Melvin carries the title nouns all the way through, consistently.